The weather is teetering on the edge of winter. We’ve had several days with dustings of snow that lasted until the sun came out. And then one day when the temperature got up to 55F and it felt like spring. A few flowers are still blooming. 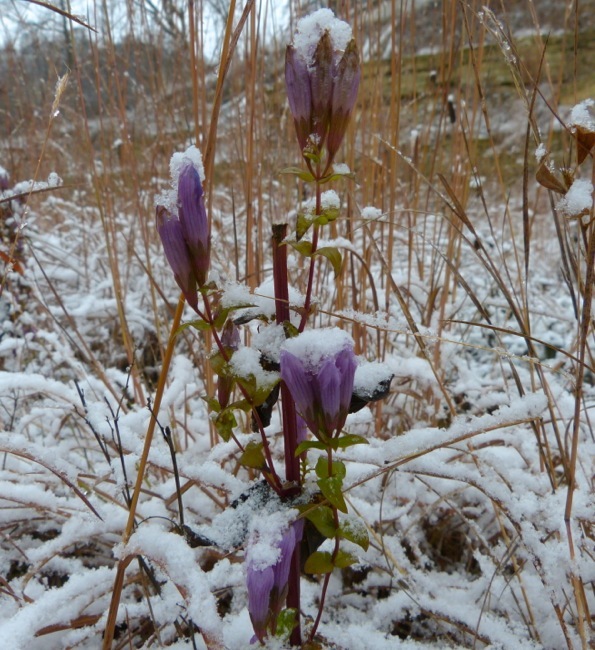 This is Stiff Gentian. 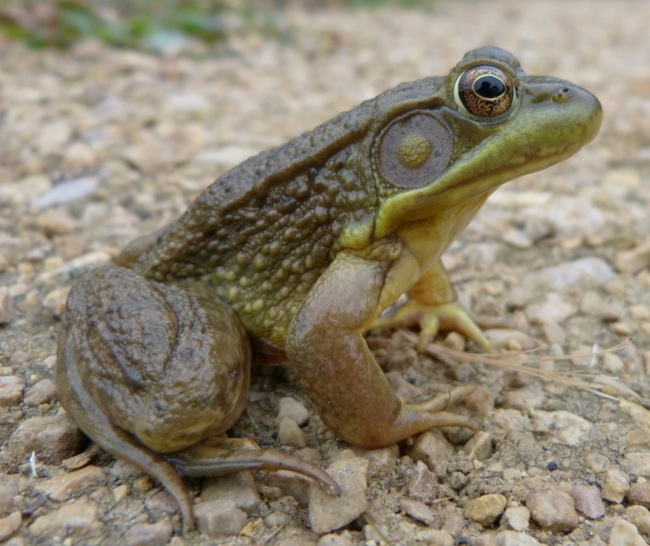 We saw this Green Frog on one of the warmer days – sitting on the driveway. 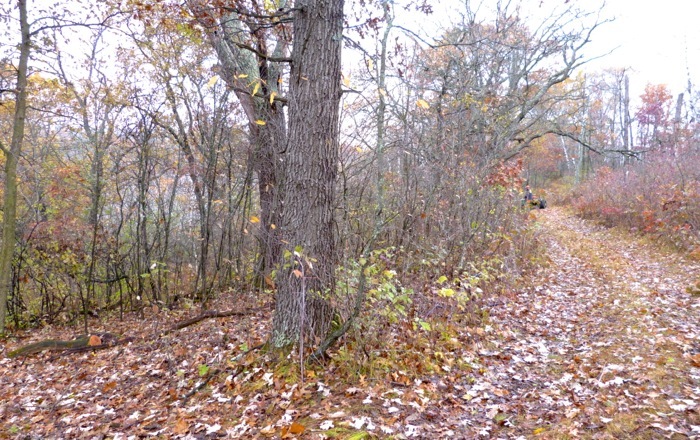 Mike and I worked more on the clearing project on Indian Grass Point that we started about a month ago. 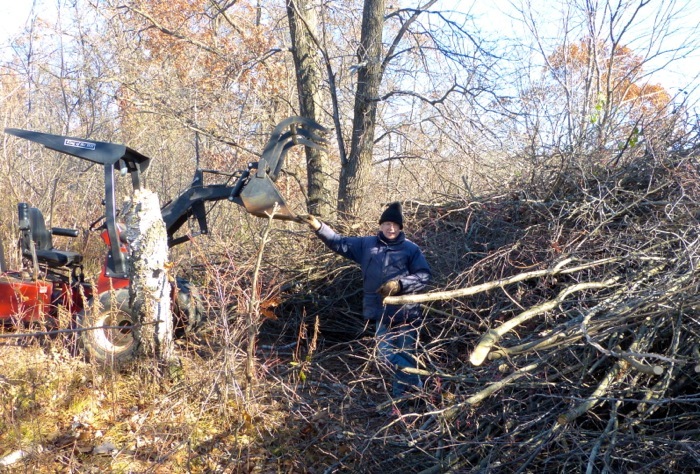 I think we’re probably done for the winter now, but we’ve cleared a couple of acres, and ‘liberated’ numerous old oak trees. 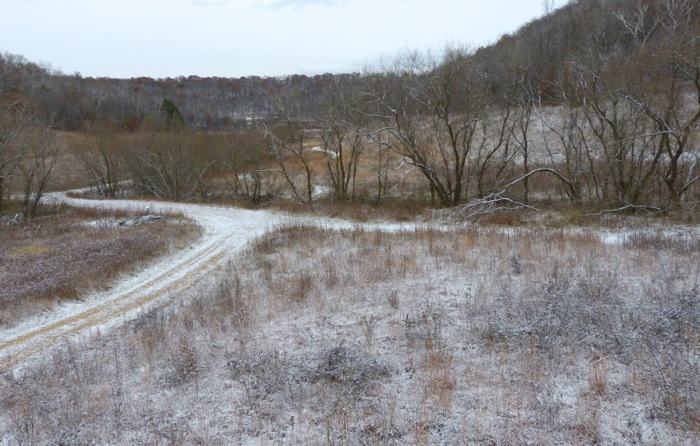 This is a view from the part we’d already cleared, looking north, into the area we were starting to work on. This is the same view, about a week later, from a slightly different angle. Now all the brush has been cleared and removed, and you can see into Ragwort Opening – a small prairie opening – in the back. 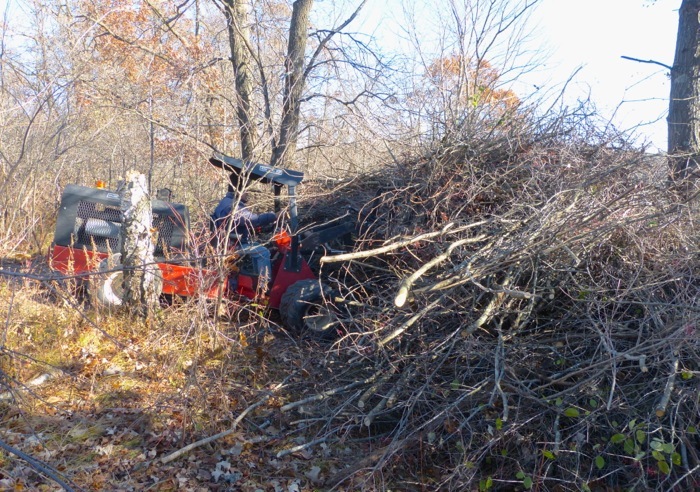 This is the brush pile we made – actually several years-worth of cuttings from various nearby projects. Mike – standing proudly by the pile with his tractor. When I mentioned “Wolf Trees” in my last blog post, I got a note from my friend Mary saying that she’s heard them called “Grandmother Trees”, because they are large and clearly grew up in the open. And around them you can usually find their “granddaughters” – smaller trees with their branches pointing away from the big tree, toward the light. So I’ve been looking for good examples of Grandmother Trees. 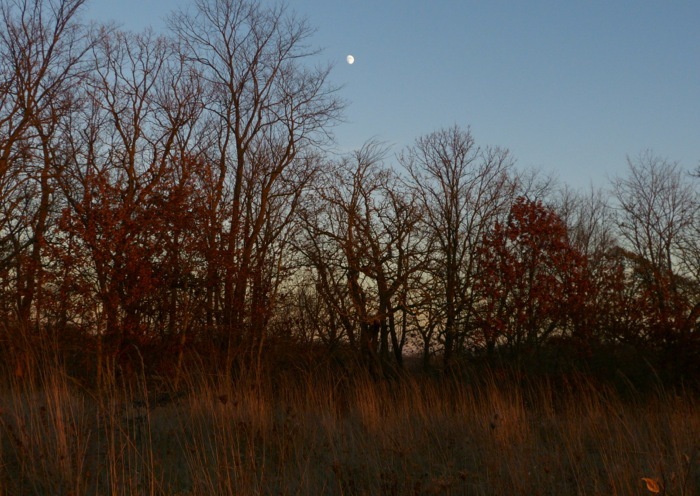 Here’s my favorite – from Hidden Oaks Prairie. 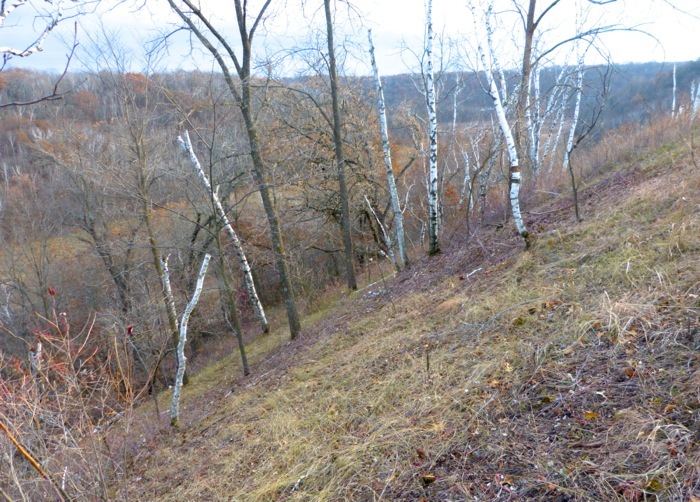 I’ve been working by myself on another part of Indian Grass Point – the very steep slope on the east facing side of the point. 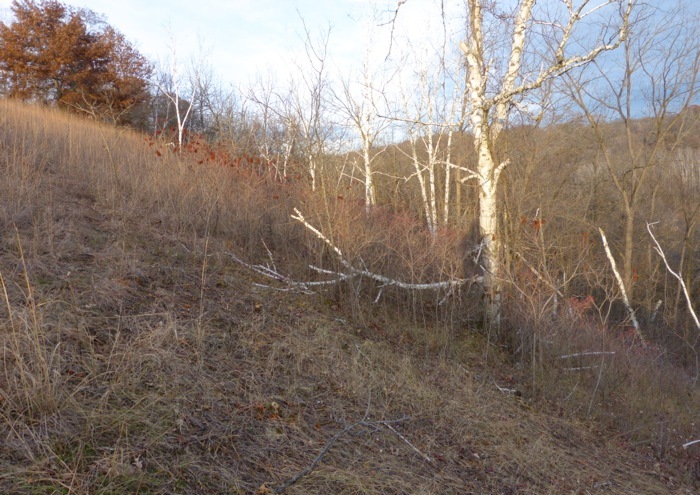 The top of the point is prairie, and over the last few years I’ve been clearing the sides, which have prairie vegetation under invading brush. 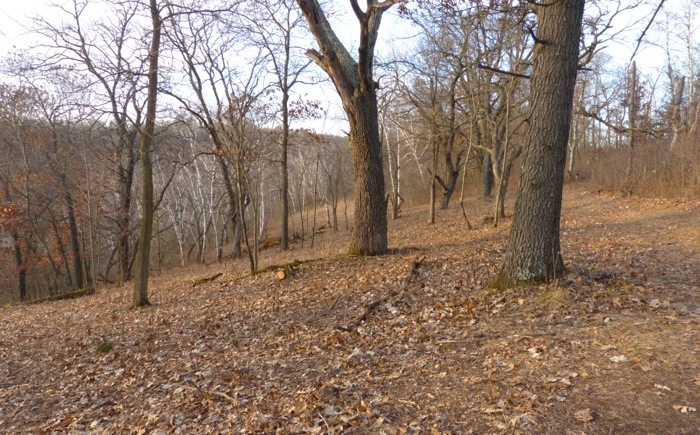 The slopes are so steep that we can’t use either a mower or the weed wacker, so I’ve been clearing by hand – cutting the brush and treating each stump with herbicide so it won’t resprout. Here’s the part I’ve cleared in the last few weeks, looking south toward the point. 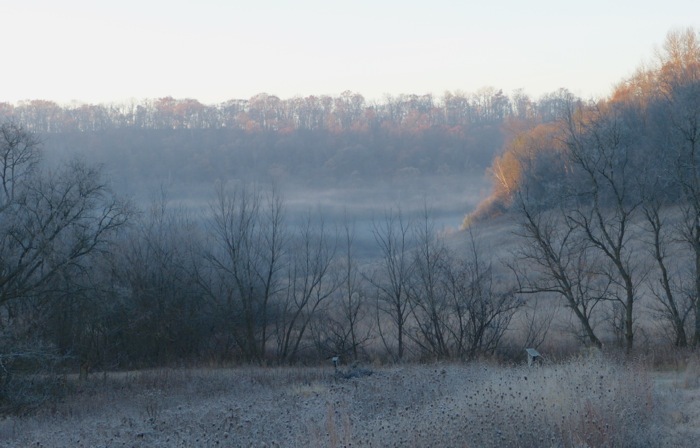 This picture was taken from the same spot, looking north, into the part that hasn’t been cleared yet. 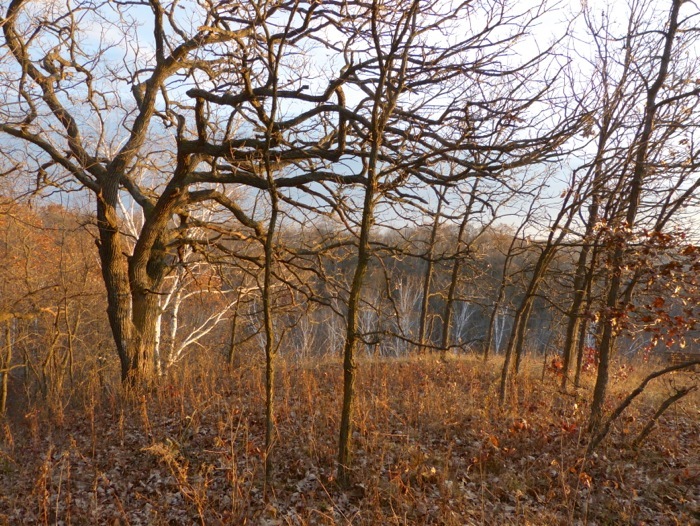 I hope to someday clear the slope all the way to the edge of the prairie – past the large Hill’s Oak on the top of the ridge. I walked through some of our big planted prairies a few days ago and saw a huge flock of Wild Turkeys – at least 30 or 40 of them. They were running back and forth, chasing each other, and spreading their tails. 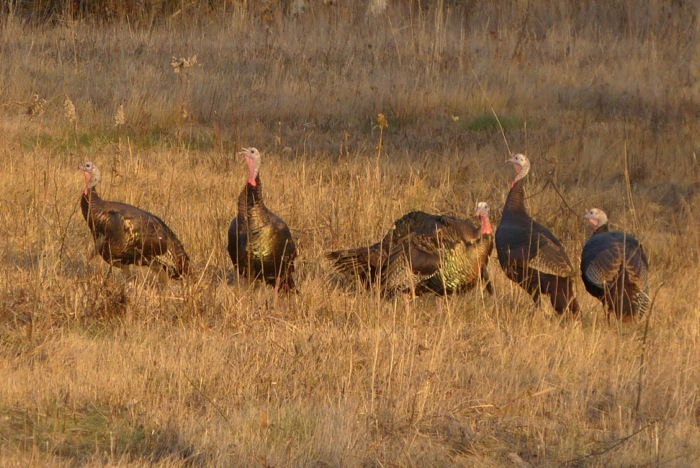 I read that family groups of turkeys often gather together during the winter. I wonder if the young ones are practicing for their first spring mating season. 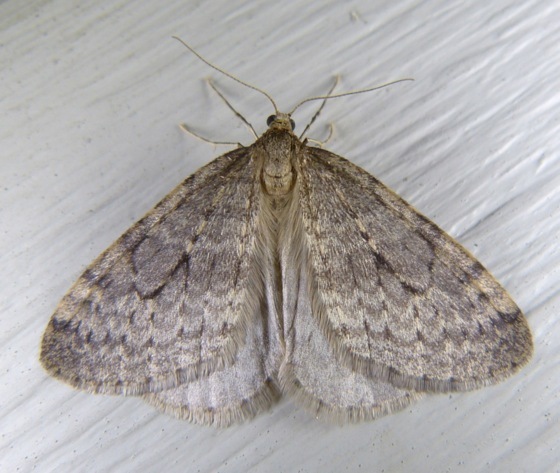 There are still a few moths coming to lights, and a few more at my bait. 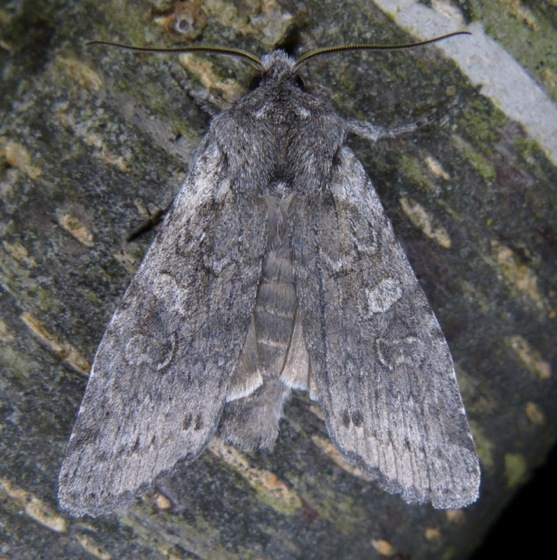 Bait (sugary, fermented fruit that mimics tree sap) seems to work better at this time of year to attract moths. 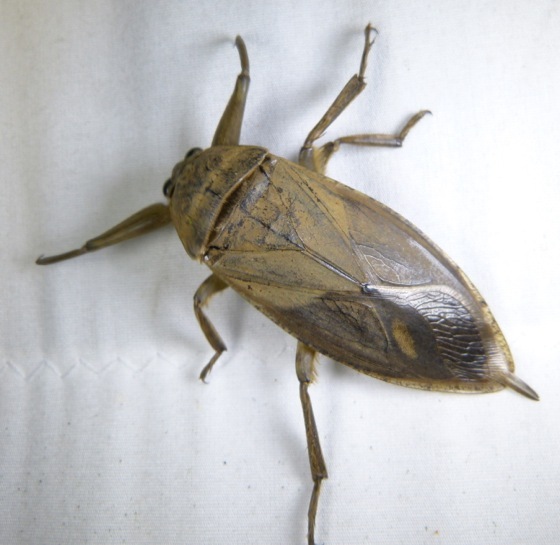 This Giant Water Bug came to my lights last week. 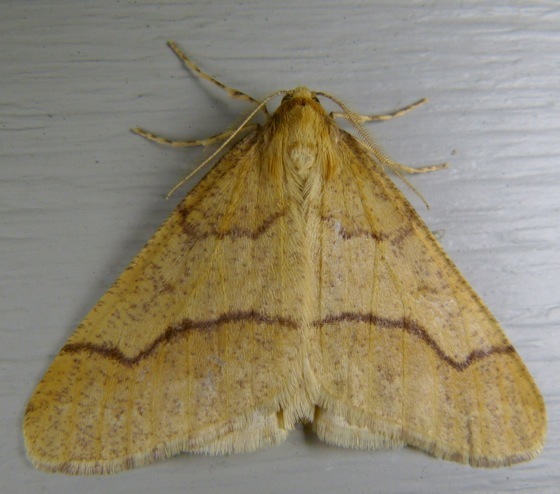 These are the only two species of moths that are coming to the lights right now. This one was on the bait – Grote’s Pinion. Some friends came to visit me this week, while Mike was out of town. We cooked Indian food, and talked, and walked – sometimes in the rain. 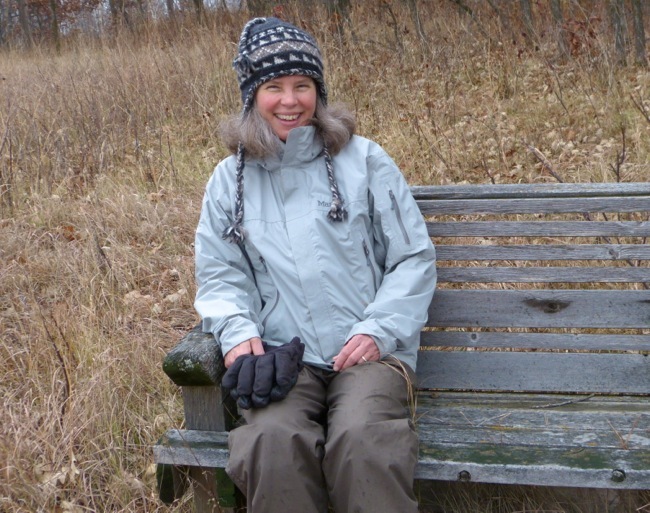 Here’s Karen, on the Hidden Oaks bench.